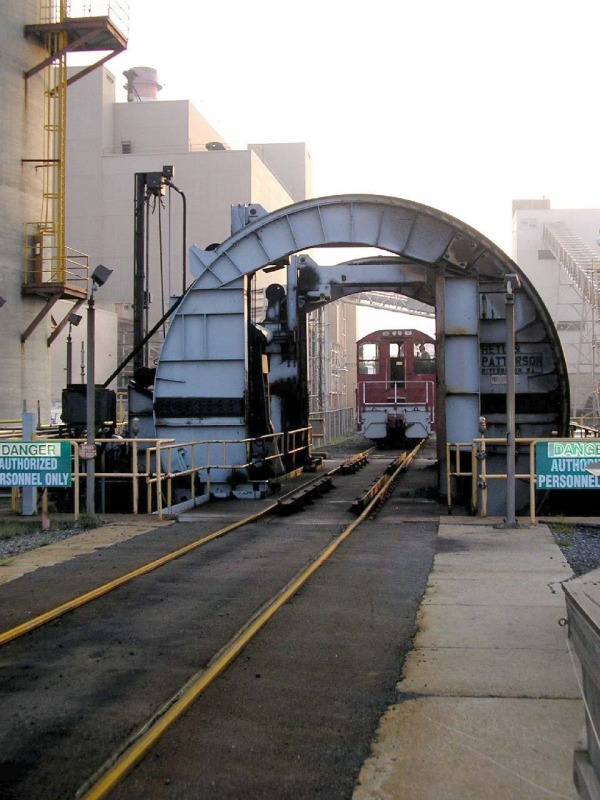 The rotary railcar dumper is an effective, time-tested machine for transferring bulk materials, especially for unloading coal at power plants. The rotary dumper makes unloading coal a quick and simple process that eliminates waste while saving time and money. Heyl & Patterson has manufactured Rotary Railcar Dumpers for decades, and is one of the companies that pioneered the technology. 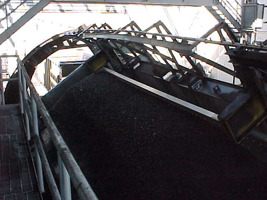 Unloading of coal at a power plant is much more streamlined with a rotary dumper, also known as a wagon tippler, than with other types of dumpers. The railcar is held in place inside the dumper with clamps, and the entire mechanism rotates so that the car is nearly upside down. This design feature eliminates the waste associated with bottom dump railcars for several reasons. First, the sloping bottoms of traditional hoppers can leave some coal inside the railcar even after unloading, usually due to clumped or frozen material. Second, bottom dump railcars have the potential to spill their contents onto the tracks, especially if there are any imperfections in the seals of the doors. Third, bottom dump railcars often have a more lengthy process of unloading for the previous two reasons. With rotary-coupled cars, loads can be dumped without unhooking the railcars from one another, which is a system referred to as unit-train. As long as the cars are equipped with rotary shaft tight lock couplings, then the dumper rotates the cars on the axis of the couplers. Two railcars at a time can be dumped in this manner in a tandem dumper. Heyl & Patterson Rotary Railcar Dumpers can unload a car in as little as 35 seconds and dump as much as 5,000 tons per hour, or as much as 10,000 tons per hour in tandem configuration. This machine is simple and user-friendly, and takes only one operator to maintain total control. The rotary dumper is also safer compared to other dumping systems. When a load of coal becomes frozen or wet, it can become an unwanted expense and safety hazard. Since a load of frozen coal may not be entirely unloaded in a bottom dump car, the load is sometimes electrically warmed in a "thaw shed" in order to loosen the material. Because the practice of heating a load of coal can be a dangerous proposition, the rotary dumper can alleviate that problem. Even when a load of coal is wet or frozen, the rotary dumper can still quickly unload the coal without increasing labor, demurrage and safety hazards. A Hammermill can also be added beneath the dumper to further break up frozen coal after unloading. Heyl & Patterson also offers C-Shaped Rotary Dumpers and Turnover Dumpers that can meet the needs of various types of site conditions.